Unwind at the Hilton Irvine/Orange County Airport hotel, situated directly across the street from the John Wayne Airport in Orange County California, and offering a complimentary airport shuttle. Set in the heart of Orange County, Hilton Irvine is in close proximity to several Fortune 500 corporations. This Irvine hotel boasts over 20,000 sq. ft. of flexible meeting and banquet spaces for up to 800 guests. Stay connected with complimentary WiFi throughout the hotel, and catch up with work in the 24-hour business center. An internet service level upgrade is available - nominal fees apply.Relax in a comfortable guest room with a 42-inch flat-screen TV, flexible work space and Hilton Serenity bed collection. Indulge in delicious American cuisine with a Californian twist at the Aura Bar & Grill. Keep fit in the complimentary 24-hour fitness center complete with modern equipment. Refresh in the hotel’s outdoor heated pool before relaxing in the whirlpool. Experience a true getaway at our Homewood Suites by Hilton Irvine John Wayne Airport hotel, just minutes from the beach, Disneyland and the John Wayne Airport. This upscale, extended stay hotel makes you feel at home with plenty of amenities and exceptional service.Wake up to free hot breakfast served daily as well as an evening social* served Monday through Thursday. Our suites provide a full kitchen, complimentary internet access and a 42-inch HDTV. Warm yourself under the southern California sun at our outdoor pool and whirlpool. Gather friends and family for a game on the outdoor sport court or for an indoor game of pool or shuffleboard. Plan your next Orange County event in one of our three meeting rooms with 1,200 sq. ft. of space for up to 50 people seated for a dinner reception. *Local and state laws apply. With a stay at Atrium Hotel at Orange County Airport, you'll be centrally located in Irvine, within a 10-minute drive of South Coast Plaza and Segerstrom Center for the Arts. 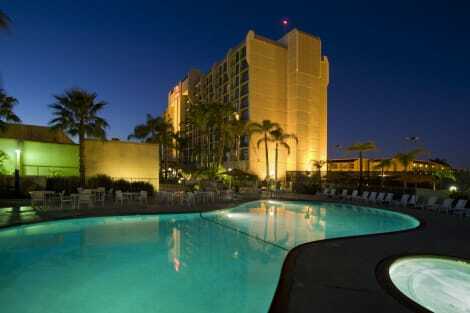 This hotel is 4.4 mi (7.2 km) from University of California-Irvine and 5.2 mi (8.3 km) from Fashion Island. Don't miss out on the many recreational opportunities, including an outdoor pool, a spa tub, and a fitness center. Additional features at this hotel include wireless Internet access (surcharge), a television in a common area, and a picnic area. While the golfer in the family is out on the course, try one of the other recreational amenities offered, such as an indoor pool or a spa tub. This hotel also features complimentary wireless Internet access, concierge services, and gift shops/newsstands. Make yourself at home in one of the 170 guestrooms featuring refrigerators and microwaves. Your bed comes with down comforters and premium bedding. Wired and wireless Internet access is complimentary, while 42-inch flat-screen televisions with premium TV channels provide entertainment. Conveniences include blackout drapes/curtains, as well as phones with free local calls. Be sure to enjoy recreational amenities, including an indoor pool, a spa tub, and a fitness center. This hotel also features wireless Internet access (surcharge), concierge services, and wedding services. Guests can catch a ride on the complimentary shuttle, which operates within 1 mi. Make yourself at home in one of the 252 air-conditioned rooms featuring refrigerators and LED televisions. Cable programming and MP3 docking stations are provided for your entertainment, with wired and wireless Internet access available for a surcharge. Private bathrooms with shower/tub combinations feature complimentary toiletries and hair dryers. Conveniences include phones, as well as laptop-compatible safes and coffee/tea makers. Enjoy a range of recreational amenities, including an outdoor pool, a spa tub, and a 24-hour fitness center. Additional features at this hotel include complimentary wireless Internet access, concierge services, and a fireplace in the lobby. 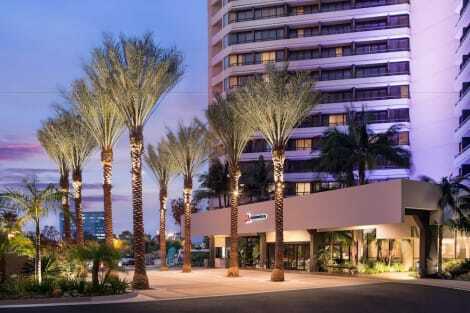 Located in Irvine, Irvine Marriott is by the ocean, within a 10-minute drive of South Coast Plaza and Orange County Fairgrounds. This 4-star hotel is 3.4 mi (5.5 km) from University of California-Irvine and 6.7 mi (10.9 km) from Santa Ana Zoo. Featured amenities include a 24-hour business center, limo/town car service, and express check-in. Planning an event in Irvine? This hotel has 35000 square feet (3252 square meters) of space consisting of conference space and a meeting room. A roundtrip airport shuttle is complimentary (available 24 hours). lastminute.com has a fantastic range of hotels in Irvine, with everything from cheap hotels to luxurious five star accommodation available. We like to live up to our last minute name so remember you can book any one of our excellent Irvine hotels up until midnight and stay the same night.